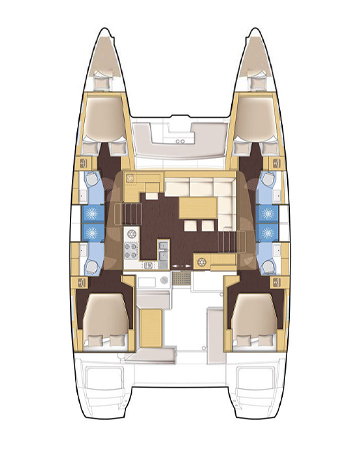 LAGOON 450 is one of the most successful catamaran model ever made. High level of comfort, luxury and safety. Large indoor saloon with an amazing 360 degree panoramic view. The saloon is fully air-conditioned with 26 inch flat TV and Bose sound system. Home style kitchen equipped with 3 sinks, cooker, oven, microwave, fridge/freezer, coffee machine and barbeque. Four double bed cabins for guests with large windows and separate air-conditioning system. Each cabin has it’s own en-suite shower and an electric toilet. Hot water, hairdryer, fresh bed linen and towels are included. The skipper has his own cabin and toilet. Optional equipment & Packs are not commissionable and subject to availability. Disembarkation: Ending day by 09:00. Compulsory: Return to base the evening before disembarkation, at 18:00, the latest. 50% of the amount paid will be refunded if you cancel more than 1 month in advance of the charter date. No cancellations can be made within 30 days of the charter date. The entire amount paid will be retained in this case. We recommend that guests take out optional insurance that compensates them in full if the charter is cancelled due to their own fault.